Push-up on one arm and one leg (OAOLPU) is easy. Unless you do it correctly. Yes, I know how that sounds, but bear with me for a minute. Chances are, by the end of this article you will agree. Lie face down on a flat hard surface. Place the palm of your left hand on the floor close to your lower ribs and spread the fingers so as the middle finger is pointing forward (if you’d rather use your right hand, invert the following indications accordingly). Your left forearm should be vertical, your shoulders pulled toward your hips. Spread your feet about twice your shoulder-width. Dorsiflex your right foot as much as you can, curl up your toes, and stick the foot into the ground as if you wanted to kick a hole in it. Lock your right knee and hip in full extension. Lift your left leg and your right arm off the floor. Hold your breath and tighten up all over. Now, push the ground straight down with your left hand until your arm is fully extended. Shrugging is not allowed. Side rolling (neither at the shoulders, nor at the hips) is not allowed. The hips must remain in full extension. If you nailed it, congratulations! No need to read any further. If not, I hope you will find the following six simple steps useful to get there. Begin by getting into the correct position. Spread your feet somewhere between hip- and shoulder-width and keep them at the right angle to the shins. Lock your knees and hips in full extension. Keep your back straight (for now, maintain the normal curvatures: neither hyper lordosis, nor hyper kyphosis anywhere). Your hands should be flat on the ground, shoulder-width apart, fingers spread with the middle finger pointing forward. At this stage, your arms should not be vertical but slanted a little forward. The shoulders should be protracted but not disconnected from your torso (do not let your shoulder blades flare, all the while avoiding excessive flexion at the T-spine). Finally, keep your neck neutral and your head in natural alignment with the rest of your body. One of our main concepts at StrongFirst is “linkage versus leakage.” It means that in order to express our strength at its highest level, we have to get as tight as possible (except at the moving joints) so all our effort is directed into the movement we want to do rather than spent in modifying our posture (i.e. an unwanted lumbar spine extension). All our plank variations are exercises in tightness. The idea is to “compress” the body along its axis from the ankles to the shoulders. Think about it like compressing a spring. As long as you respect the axis, you might be able to eventually turn the spring into a steel pipe. Start by simultaneously contracting the flexors and extensors at your ankles, knees, hips, lumbar, and thoracic spine. Then, pull your shoulders toward your hips along the same axis by contracting your lats. Finally, pull your chin in (but don’t let your head move forward—away from the axis). Do these contractions progressively and consciously so whenever your body gets out of alignment you can feel and correct it. Pulling your shoulders toward your hips while keeping the elbows locked and the shoulders protracted will make your body dive forward—unless you resist by digging your toes into the ground. If you do that correctly, your arms will get closer to the vertical and instead of moving forward your body will rise an inch or two. First of all, let’s understand the difference between a regular and a Hard Style push-up. One thing we know is that when our body has to perform an effort, it unconsciously tries to make it as easy as possible through short-term compensations (shifts and adjustments). “Short-term” because our body only “cares” for the immediate benefit while completely disregarding the risks and the long-term costs for the overall health. So, how does our body compensate to make the push-up easier? As with all bodyweight exercises, the load (our body) remains the same. What can be changed is the leverage. By applying our strength farther from the base (our feet), we reduce the effort required to lift our body. Thus, we will be more comfortable placing our hands farther forward (picture the arms slanted backward in the High Plank position, at the right angle to the torso), and/or shrugging and flaring the elbows when doing the push-up. This also reduces the distance our body travels (with our hands farther forward we will be a little closer to the ground). Sure enough, it only works to a point. Pushing our hands even farther forward will completely change the movement. Actually, we can make it either even easier, or way harder, depending on the surface we’re on (slippery or not) and on our focus. If you’ve already practiced the Step 1, you know the anterior chain plays the main role in maintaining our structural integrity in the High Plank (keeping the “spring” well compressed along the axis), because it has to match the combined “effort” of gravity and of the posterior chain. Doing the High Plank on a slippery surface (or using an implement like the ab wheel) with the hands farther away from the feet makes even just holding the plank way harder. On the contrary, if the surface we’re on is “sticky”, we can shift the focus to the posterior chain by pushing forward through our hands and backward through our feet. Flexing (“breaking”) our hips, shrugging, and/or flaring the elbows will allow us to involve the deltoids and the traps—more of the posterior chain! Unfortunately, that is going against the purpose of the Hard Style Push-up. Which is not just extending the arms anyhow as in the regular push-up but rather maintaining the structural integrity (the plank) while doing so. From that point of view, it is clear why we cannot allow shrugging (disconnecting the shoulders and thus, “releasing the spring”) or hip flexion (disconnecting the pelvis, shifting the effort to the posterior chain). Another usual mistake is the “disconnection” of the rib cage. In this case, nothing is wrong at the beginning of the push. But at the midpoint, when the elbows are passing the ribs, instead of continuing to the full lockout while holding the plank, the person will stick the elbows to his or her sides. He or she will then carry on extending the arms while at the same time extending the T-spine, finishing in a half-cobra pose (eventually recovering it by realigning at the end). That is clearly not what we’re looking for. So, let’s say this again: the purpose of the Hard Style Push-up is to maintain the structural integrity while extending the arms to lift our body off the floor. 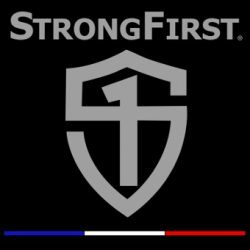 Now, we at StrongFirst are after strength. So, among the few options that remain available after applying the above condition we will rather choose the one that will eventually allow us to handle the biggest load. That is simpler than it sounds: we want to have our forearms vertical, at least through the first half of the push. There are several ways to do that. For example, we could place our hands even closer to our feet. This way, during the descent our flexing elbows will naturally go backward, pulling our forearms closer to vertical. Start in the High Plank with your arms vertical, your feet in maximum dorsiflexion, and your head five inches away from a wall. Keeping your forearms vertical, flex your elbows and pull yourself forward against your feet’s resistance until you touch the wall with your forehead. Recover by pushing down and pulling even stronger with your feet. As you get used to the movement, you’ll be able to start farther away from the wall until you reach your upper arm’s length. That is as far as you can go forward while keeping your forearms vertical. As you will discover, the “load forward” version is much harder than your regular push-up. So, increase your ROM progressively and do not hesitate to use assistance. For example, you could use an elevated support for your hands (the shorter the vertical projection of your ROM, the less effort your movement requires). In that case, make sure to hold the plank and to keep your forearms at a right angle to your base (the line connecting your feet with your hands). A simple tip is to try and touch your support (a racked barbell or the edge of a bench, as pictured) with your stomach below the ribs rather than with your chest. These days everyone knows about the fascia, the “anatomical trains,” and the fact our body is built of multiple “X’s” (fascia tension lines crossing each other). The biggest “X” is the one that incorporates our whole body, arms and legs included. Based on that, we can legitimately consider the Hard Style Push-up as the mean of reinforcing our big anterior “X”. This is especially true for the wide-base version where we align each of our hands with the opposite leg. To do so, we need to spread our feet pretty far apart. The surest way to get there is to cycle through the High Plank/Hard Style Push-up progression, putting your feet farther and farther apart, going as wide as double your shoulder-width. This step is crucial and also one you will probably spend a lot of time on. As with the regular Hard Style Push-up, we will begin with the High Plank. Assume the wide-base push-up position, tighten up, and then lift one of your feet off the ground by further extending the hip (just a little—an inch off the ground will do). Your weight distribution will shift, but the rest of your body should not move. If you need to adjust your position, do it. But at your next attempt, get into that adjusted position right from the start, before lifting your foot. Sure enough, holding the plank (loaded hip locked in extension) and keeping your loaded foot vertical is non-negotiable. Once you master the One-leg Wide-base High Plank, proceed to the push-up. The idea is to make it absolutely identical to the regular wide-base version. If they couldn’t see your legs, no one should be able to tell whether you’re doing your push-up on one foot or two. To avoid your body swaying off course, place yourself over a straight line on the floor (trace it with chalk if you have to) and make sure it matches your mid-line at all time. This visual anchor will help you control your movement much better. As you’ve already noticed, in the One-leg Wide-base High Plank the hand opposite to your free leg (the one off the ground) is almost unloaded. So, the next thing to do will be to unload it completely and lift it off the ground, too. That might require a minor adjustment in your position. As with the previous step, make sure to incorporate that adjustment in your basic Wide-base High Plank from then on. The goal of this step is to be able to lift one leg and the opposite arm at the same time with no shifts or adjustments. At this point you’ve mastered the High Plank and are able to keep “the spring compressed” whatever your position. You have also developed your pushing strength. To close the gap remaining to the OAOLPU, you might need to introduce assistance. One of the options I would recommend is to modify the One-leg Wide-base Push-up’s starting position by straightening the “free” arm along the body and putting the “free” hand on the ground somewhere at the mid-thigh level. It will be easier and even better to touch the floor with the fingertips rather than the palm. Doing your push-up in that position will magnify shifts you weren’t aware off while providing minor weight-bearing assistance to the loaded hip. The progression will consist in taking your fingers off the floor one by one and/or in touching the floor only when the loaded arm is in full flexion. Note: You might ask, “What about the incline OAOLPU?” I would advise against it for one simple reason: even if you did them correctly (your forearm at the right angle to the base), your weight distribution would be very different from the floor OAOLPU. That might mess the movement map in your brain and hold you back instead of helping you forward. So, here they are, the six simple steps that will help you master the OAOLPU. As you have seen, they are pretty simple. But do not let that simplicity fool you. The devil is in the details. You absolutely must respect the rules and be patient in order to turn this amazing exercise into what we, at StrongFirst, intend it to be—yet another weapon against weakness.